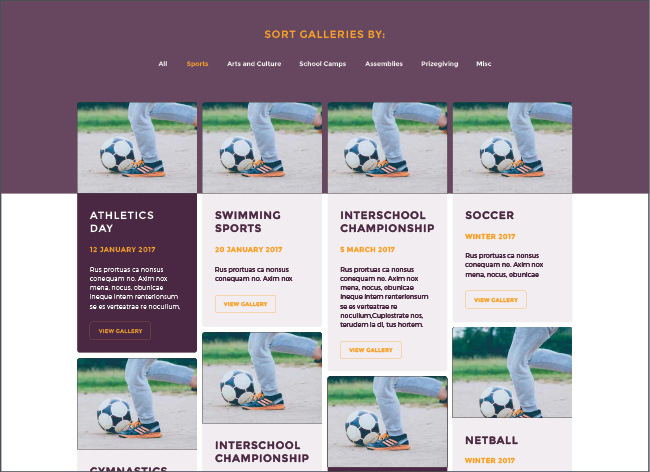 GoWeb is an unparalleled website solution built specifically for schools, charities, community groups and not-for-profit organisations for a portion of the cost of a custom-built website. As a boutique design and marketing company our client’s needs are paramount. GoWeb has been built with your needs in mind – ensuring that you can communicate the right message in the best possible way while also ensuring your website works as a functioning marketing tool for your organisation. We know that schools and not-for-profit organisations are busy places – with huge pressures placed on staff and administrators. GoWeb has been specifically designed so that it is easy to update and amend information while still giving you an elegant design result, packed with useful functionality. The price includes a 60 minute training session and comes with a user manual for basic editing and setup information. user-friendly, robust and highly secure. Your GoWeb template has been designed to offer all the functionality (and some more) that an organisation of your type needs – without breaking the bank. GoWeb allows you to easily upload your organisations logo. Plus, you can make your website truly personalised by editing the colour scheme and fonts as well. Functionality and usability was top-of-mind when we created this design. Information is easily found via the menu across the top, and is supplemented with an integrated Search feature. A built-in Notification Bar allows you to publish a temporary message, ensuring visitors to the site are always kept informed. This could be alerts around school closures or upcoming events. As a design-led solution, GoWeb features dynamic layouts and full-size imagery to provide an insight into the day-to-day life of your organisation. A secondary Search bar, positioned part way down the homepage, ensures any visitor can easily find the information they are after. A simple visual grid allows you to promote key sections of the website on the homepage, ensuring that the most important information is seen first. An automated Events feed will show visitors to the website the nearest upcoming events, in chronological order. and parents by promoting your social media channels. A dedicated slideshow, built in to the footer of the wesbite, allows you to showcase the logos of your valued sponsors as a way of saying “thanks”. Interactive map functionality allows people to easily find key events or locations. Plus, you can load multiple maps into the site, depending on intended usage (i.e. contact page, events page, gallery). Pop up windows for adverse events, key messaging or newsletter signups. Events calendar that can sync to a Google calendar on a parent’s or member's device. Flexible form editor that you can easily set up and save as a custom form. Submissions are emailed to the nominated recipient and retained in the system so you can export them out as a CSV. Optional online payment through a secure credit card payment gateway is also offered.